Vegetables and cheese just plain go together, complimenting each other in a wide variety of dishes. Think quiche. When you are lactose-intolerant, this is one of the dishes you must say goodbye to. Not any more. With the many cheese substitutes that can be found today, and their flavors and textures that are so remarkably close to the original, your favorite cheese dishes can now be quite easily adapted. Vegetable Cheese Pie is a favorite of mine. It tastes sensational right out of the oven, but is also good warm. With a side of soup or fruit salad, and some great crusty bread, this is the complete meal. I have served this dish to the non-lactose intolerant, and no one could detect that it was not dairy. Enjoy! Preheat the oven to 400 degrees F, and oil a 9 inch pan. Combine the grated sweet potato, onion, salt, and egg. Pat into the pan and build up the sides to the top. Bake for 30 minutes, brush with a little oil, and then bake it for about 10 minutes more. Remove from oven; then turn temperature down to 375 degrees. Heat the olive oil in a large skillet, and add the onion, garlic, salt, pepper, and herbs. Saute about 5 minutes. Add the other vegetables and cover; cook until tender, about 7-8 minutes. Next, spread half of the chees onto the baked crust. Spoon the sauteed vegetables on top, then sprinkle the remaining cheese. Beat the eggs and the milk together, and pour on top of the vegetables. Dust the top lightly with paprika. I love soup, and autumn always stirs me to resume my soup-making. There is only one thing more comforting than watching a soup you are preparing come together – and that may be eating it. Soup warms your soul, and is good for what ails you. While this recipe is not an adaptation from a dairy recipe, it is dairy-free just the same, and one of my all-time favorites. Serve it with some warm bread and a salad and you’ve got the perfect healthy meal. In a large pot, saute in the melted margarine the onions, carrots, celery, and garlic under softened but not browned. Add the mushrooms and cook until soft. Add the broth, seasonings, and barley. Bring to a boil and simmer 2 hours or until barley is tender. Add the dill and parsley just before serving. This is my patented gravy. Heat olive oil in large pot, and saute the onion, garlic, and pepper til soft. Add the canned ingredients and stir everything to blend evenly. Add the seasonings, sugar, and wine to taste. I know that’s quite a vague direction, but it can be highly individualized. As a rough estimate, I would say to start with a tablespoon of each herb, and a teaspoon each of salt and pepper. Sugar and wine, 1/4 cup each. Stir this in carefully, cook for an hour on a low stove setting, and adjust flavors accordingly to how you like them. When I think of Italian food, the first ingredient that always comes to mind for me is the tomato. Mozzarrella and Parmesan cheeses are a close second. When I first realized that my body could no longer tolerate dairy products, one of things I missed the most was cheese. And especially cheese in Italian food – they just seem to have been made for each other. Fortunately, there are many products currently available, not only in specialty stores, but many on supermarkets shelves, that allow those of us with LI to be able to improvise and work around this limitation. Soy mozzarella cheese is packaged in chunks, slices, and shredded – texture, flavor, and melt-ability are quite comparable and suitable. In addition to being lactose-free, soy cheese has the added health advantage of no cholesterol, so you are really giving yourself the healthy alternative. Tofu is the perfect medium and replacement for riccotta cheese in lasagne; it absorbs whatever flavors it is surrounded by and mixed into, and imparts the correct texture for this dish, too. And a little dairy-free parmesan cheese sprinkled on the top crowns this flavorful and robust Italian classic. Enjoy! Prepare lasagne noodles according to package, and drain. In a large bowl, mash the tofu to a crumbly consistency. 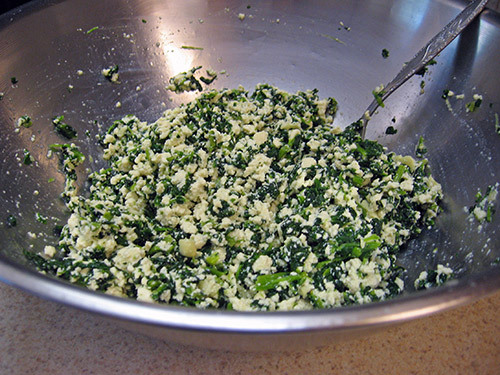 Stir in the spinach and garlic. Salt and pepper to taste. In large baking dish or pan (I use 9 x 14), spread some tomato sauce around the bottom of the pan. Place some noodles (usually about 3-4 strips) over the sauce in a single layer, covering entire bottom of pan. On top of noodles, spread tofu/spinach mixture evenly. Then layer mozzarella over this. 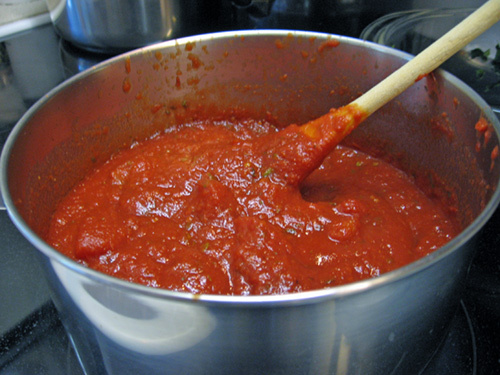 Cover everything with evenly spooned tomato sauce. Repeat the above process again, starting with the noodles and finishing with the sauce, two more times. Sprinkle the parmesan over the top. Place pan in oven, covered with tin foil, and bake for approximately 30 minutes. Remove the foil, and bake an additional 15 minutes, crisping the top a little. 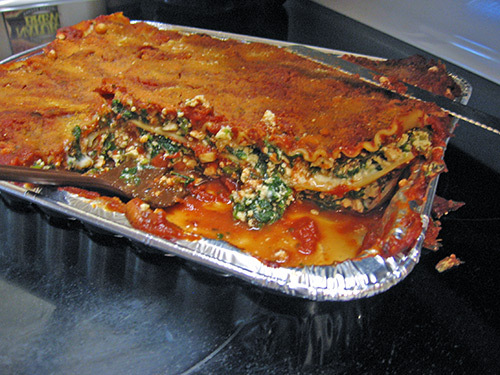 Serve and delight in your nondairy lasagne. With a salad and some garlic bread, this makes a great dish for company, serving 6-8 people with food to spare. You can certainly play with this recipe, and personalize it to your tastes and likes. Soy cheese and tofu lend themselves to an endless variety of experimentation and exploration. One of the hardest things about living without milk is being around those who live with milk and other dairy products. Some experiences stand out more than others; all are a drag. I can remember traveling with my husband and son about 10 years ago in Florence, Italy, where some of the world’s best gelato is purportedly made. They told me it was like heaven on earth, and from the looks on their faces, I believed them. I think about dining out with friends or family, and finding way too many items on the menu with either cheese or a cream sauce in it or on it. I tire of asking my servers if a delicious-sounding dish has any dairy in it, and wonder if they are weary themselves of my dietary peculiarity. I have learned to read packaging and labels very carefully, and look for “hidden” lactose – things like whey, creme fraiche, foreign cheese names, even yogurt bothers my digestive tract. Sigh. When invited to someone’s home for a meal, I must diplomatically remind them or inform them of my dairy limitations. They are always quite gracious, but part of me knows that they now must begin frantically revising their menu. I always offer to bring some homemade items of my own, to ease their lactose-free quandary, and to ensure that there is food there that I will eat (and like). I often wonder what it was like during Prohibition, when all Americans were forbidden to drink alcohol? Sometimes I liken my LI to this imposed alcohol moratorium . The movement did not get rid of peoples’ desire to drink; just as Lactose Intolerance does not remove my yearning for dairy products. In fact, like those who lived during the Prohibition, my desire for the “illegal” substance better known as dairy grows and grows. So, I continue my search for recipe substitutions and adaptations. This blog is my speakeasy and my refuge, because I cannot resist trying to satisfy my never-ending dairy urges. The first recipe I would like to share with you is the one I used for the banner photo. It is called Cherry Clafouti. Clafouti is a classic French dessert that is somewhere in between a pudding and a cake, with fruit baked inside. (Disclaimer: I have adapted it from a similar recipe found on Epicurious.com) It is very easy to make, and has a beautiful and elegant presentation. I made this one with fresh cherries in season, but substitutions can be easily made (think blueberries, apricots, peaches). The first step in the original recipe calls for pulverized almonds simmered in whole milk and then the almond solids strained, imbuing the milk with an almond flavor. This dairy ingredient and entire step can be easily circumvented by simply substituting almond milk. LI sufferers everywhere, rejoice, and enjoy some Clafouti now! Preheat oven to 375 degrees F. Grease a 10-inch diameter glass pie dish; sprinkle with 1 tablespoon sugar. Scatter cherries evenly over bottom of dish. Using electric mixer, beat eggs, almond extract, salt, and remaining 1/2 cup sugar in medium bowl until well blended. Add almond milk and beat to blend. Sift flour into egg mixture and beat until smooth. Pour mixture over cherries. Bake until set and knife inserted into center comes out clean, about 30 minutes. Cool completely. Can be made 6 hours ahead. Let stand at room temperature. Lightly dust clafouti with powdered sugar and serve. Hi and welcome to my blog. At the ripe old age of 40, I became lactose intolerant, and thought that all happiness as I knew it had ended. I was wrong. What follows are my experimentations and endeavors into the not-dairy-but-you’ll-never-miss-it world. If I have succeeded even a little bit in sharing some of it with you, then I consider this blog a success. What you’ll find here are mainly recipes, recipe adaptations, and many tips that I have found along the way to the dairy-free zone. Gotnomilk? No problem!